The RV aircraft are renowned for the incredible visibility afforded by their large canopies. However, the panoramic view comes with a price; Big-time solar exposure. Van's is very implicit about the need for adequate ventilation in the cabin, but sometimes the solar assault overcomes the ventilation system resulting in half-baked RV pilots and medium rare avionics. I have read of pilots experiencing rather uncomfortable burns (not actual burns of course, but unpleasant nonetheless) on the back of the neck and ears. Here in the South, we occasionally see redneck pilots (these are the ones that enter trailer parks as waypoints in their GPS), but arriving at your destination with a broiled neck is definitely not cool! 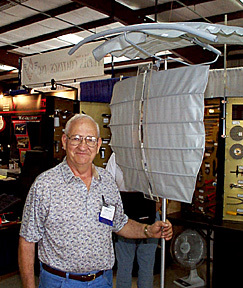 I first saw the SunShade in an RV6 parked on the flightline at Sun-N-Fun 98, and then took a closer look in the Cleaveland Tools booth where Ralph Koger hisself was demonstrating his nifty invention. He eagerly pointed out the simple yet ingenious design of the shade, and the compact manner in which the shade is stored and extended. The SunShade is available for both tip-up and slider versions of the RV6/6A. 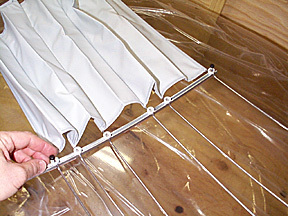 The SunShade consist of a pleated cloth shade with wire ribs which slide along an extruded aluminum track that is attached to the canopy with double backed tape. 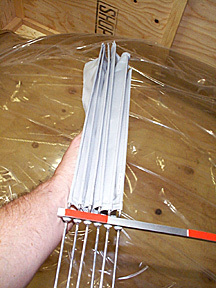 This photo shows the shade installed on one side of the rail and the wire ribs on the other. Mystery Hand points to the thumbscrew that locks the shade in the extended position. The SunShade is rather compact when it is in the stowed mode. Van's has been flying the SunShade on their aircraft for some time now and seem to be pleased with the performance of the shade. I see no reason to think that I will not likewise be spoiled by the option of having either shade or unrestricted vision, whichever is desired at the particular moment. The construction of the shade appears to be rather good, and Ralph has developed a unique product, one that fits into the category of "Why didn't I think of that?". The thumbscrew could possibly be replaced by a more sophisticated item, but I guess if it works and ain't broken, there is no reason to fix it. My first impulse at seeing the SunShade was that it may be a little overpriced, but no doubt future use will prove its value in the real world of RVdom. I recently installed the Sunshade on the sliding canopy of my RV6A. The installation was straight forward. It will be even better if you don't wear bifocals or, like me, trifocals. You must sit in the cockpit and close the canopy to drill and tap the mounting holes (3) in the fore and aft canopy support bar. This results in your eyes being very close to your work which , in my case was too close for the bifocal lens to work. It all worked out fine ( as my 83 year old mother says, growing old is hard work). The final installation is very well designed and the shades fold or slide aft nicely if not needed. The big canopy is great for visibility but not sun protection so long sleeves, sun protection cream and a baseball hat are standard procedure for flying in sunny weather. The new sun shade worked very well and made a noticeably difference. It covers the two seats nicely. No problem looking up to the left from the pilot seat, and not much vision cutoff looking up and to the right. Certainly superior to my previous Tripacer and any spam can. Since I fly with a billed cap, looking up is not practical since the bill of the cap hits the canopy before you can get your head back. The new sun shade is no worse. I am 6' 2" and have no problem with headroom wearing a headset. The shade fits very nicely against the canopy with the sliding bows conforming to the curves. Minimal reduction of headroom. To summarize, I think this is great product for sunny flying. "I purchased my Sunshade from Van's and installed it right before heading to Arlington, WA for the '97 Northwest EAA Flyin. Took maybe 1/2 hour and was very easy (tip-up RV-6) requiring no screws. My wife Janet and I used it going to Oshkosh last year and I think it's a great item. Easy to move out of the way when you don't need it, but great for that high altitude cruising. Now that I have used it for almost a year, the only complaint I would have is the "thumbscrew" release. I think for the price Ralph could/should provide a pushbutton quick release. Otherwise, an excellent product and a must have for any -6." "I have flown my RV-6 coast to coast in a day several times and around the USA on many long flights. Before I installed this sunshade dehydration was a serious problem. It works great. I do stow it during low altitude flights and when near congested areas. I can agree that the price seems high but my flying companion insists the comfort and UV protection left us no better choice. After the "sticker shock" abated I am completely satisfied."